My Card Attic: A Rare Post Indeed . . . . Hopefully! Well folks, my internet is still playing up and my headache is lingering, but I was determined to try and get something made and posted before I go away next Friday! I have been experimenting with some things I have wanted to try, techniques, products and so on. So, if the internet will allow, I will show you what I have been up to. First up is one that I have been meaning to try for a while and that is, just draw some lines in black marker in a random, geographical design (not thought out in any way) and colour the sections in with felt markers - I wanted to see what kind of results I can get with these cheap markers - they are certainly vibrant. One thing that I did notice was, that you see every stroke, but I think that that gave the sections a bit of added interest, a bit of 'texture' so-to-speak. This is the result. My second card is one that I have made with a panel that has been lying around since I realised that I had cut the wrong corner off of the embossed panel for the project I was making at the time! I also wanted to try to work with thread and try the technique that has been popular with everyone else for a long while (I am always late to the party) and I used it behind the sentiment die cuts. This is that one. Up next is a very simple one that I made from a practice piece that I tried out. My clever DH made me a home made stamp press with a hinged lid and I wanted to try double stamping (deliberately not inking the stamp completely and then inking it again to make sure it stamped in the same place . . . it did!) Of course, I couldn't just then throw it away, so I mounted it on to a base card that I had stuck patterned paper on and this is the result. This last one is one that I had been experimenting with water-colouring backgrounds in various ways and I decided to make this one into a card. I got out a cover plate die that I hadn't got around to trying yet and cut it out of my water-coloured panel and mounted it on to a dark grey panel. I then added a flower that I had already stamped and coloured, some vellum leaves and a couple of butterflies and this is the result of that session. Right, my lovelies . . . here goes . . . let's hope this post doesn't 'time out' . . . it has been a little better today, so fingers crossed! 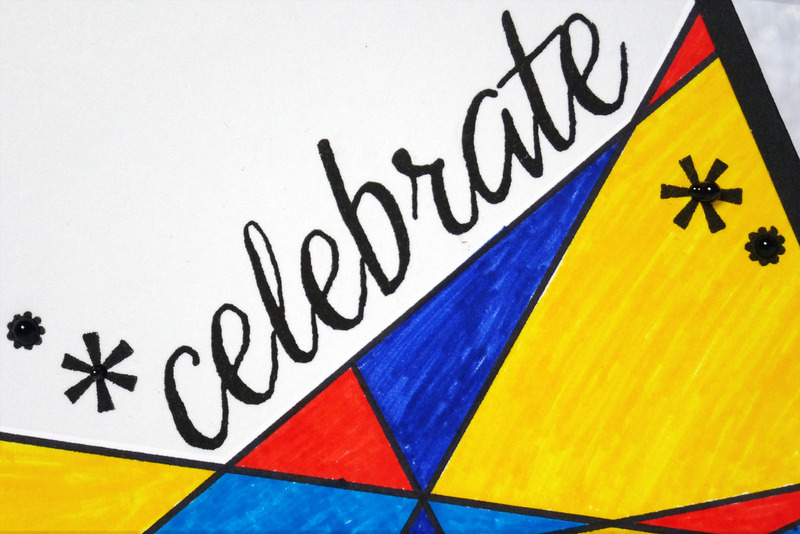 such a simple design with amazing vibrant colours, and I agree the markers do give texture. I love your last card with your water colour techinque, it's so elegant. I did get your post - so it worked, yeah! And what a surprise! Not one but four gorgeous cards! I don't even know where to begin raving! Love the technique and colors of the first one! Have to try this out! I also really love your way of cutting one corner off and putting some patterned paper behind it! (Another thing I want to try out. Hope you don't mind!) And the last card is another stunner (is that a word?) with the watercolored background, the flower and vellum leaves! Love them all! And btw, I am also always late with techniques, trends, even books and movies. Rarely among the first ones with everything, so you are not alone! love all your cards, Hazel - especially the yellow one - and the graphic line one is very cool too! WOW, Hazel, you have been busy, my friend!!!! So glad that the internet didn't play tricks on you this time, and that you could post all of these lovelies!!!! Your first hand drawn one is proof that one can do wonders with limited stuff, hey!!!! So creatively done - love the vibrant colours and the texture those lines give!!! I might just try something similar at some stage - I certainly do have very limited stuff to work with - no fancy markers, just plain old koki pens and coloured pencils - the stuff is just too expensive over here for me to buy!!!! And you have used that stunning EF again, for your second card - every time I see it I can just stare at it and put it on my very, very long wishlist!!!! 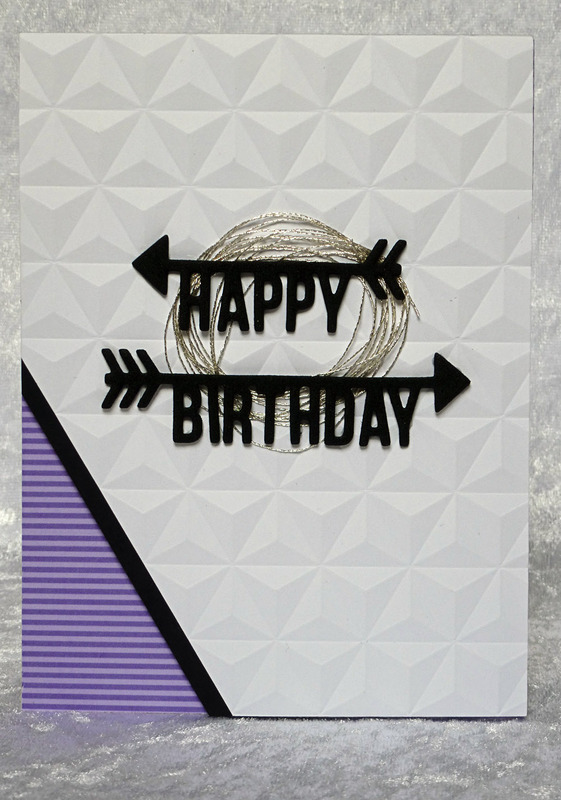 Your card is stunning - love the purple and the thread looks really great!!!! 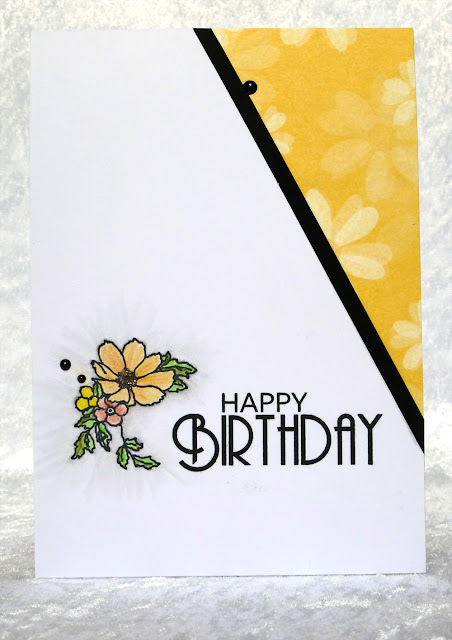 The third card is my fave of these - love those sweet little flowers and the yellow corner really catches the eye - love the black line to separate it form the white!!! The sentiment stamp is beautiful and works wonderfully here!!! The rose on the last card is simply stunning!!! I don't really work a lot with pink, but I love how you have combined it here with the dark grey and just the little bit of blue!!!! 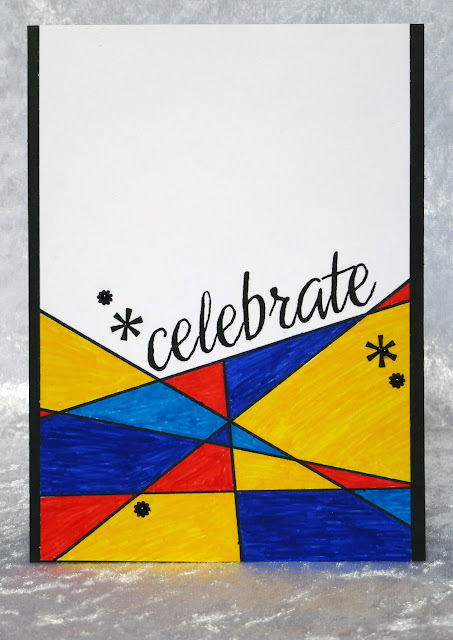 Your watercoloured background is awesome - what a fantastic cover plate!!!! 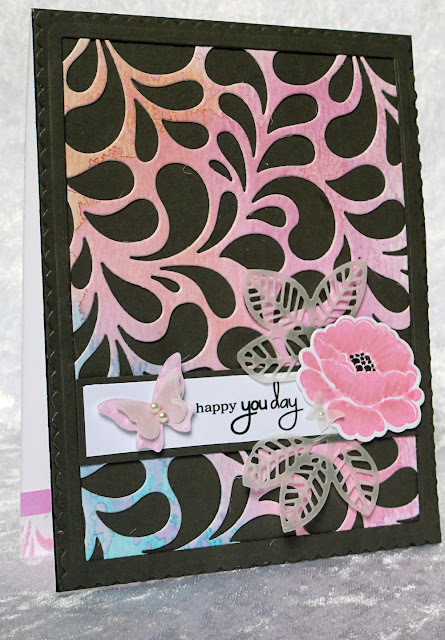 This is so beautiful, Hazel - I love the sweet vellum butterflies with the little pearls, too!!! You really had a very productive time, Hazel and your cards are beautiful!! So sorry to hear that the headache is still there - sending you 'feel better' hugs - hopefully it will be gone soon!!!!! Oh my Hazel I love all of your cards. I like the last one most gorgeous the black and the water coloured panel together. Can you tell me which die you have used ? I have been playing with different mediums too and I have now a tray full of all kinds of backgrounds. Will show later on what I did with them. Lots of fun huh ? Iove to play like this too. Well done my friend, gorgeous cards. Hope youre headache goes away soon. Take care my friend, big hug from me. You have outdone yourself, my friend! Love the colorblock card with those gorgeous, vibrant colors. And the silver thread makes such an interesting card! (I'm still late to that party but not for lack of trying.) Love that yellow, black and white and kudos to your DH for making you a stamp press! And that watercolor diecut is so pretty against the black! What a gorgeous flower too! Good for you using those "extras" -- would love to see a photo of stamp press dh made for you~ I love that last card -- all of them are unique though! So many incredible cards Hazel...love them all. 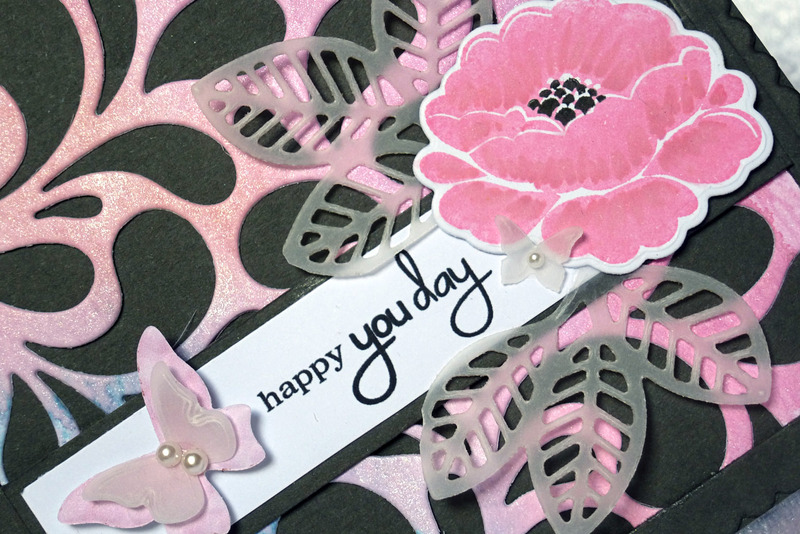 Your final card is my favorite...love all that sweet pink and vellum leaves! Feel better soon and good luck with your computer. Wow Hazel, you have been busy making gorgeous creations! Wow! Im sorry about the internet stuff and hope your headache is gone. Love your thread and I am always late to the party on things like that too. Wow! So many fabulous cards and love how you used a different technique on each one. Sounds like you were having fun playing and now have several gorgegous cards. I'm so glad this post made it thru the perils of the 'internet'!!! You certainly have been busy and they are all so amazing! Isn't it fun drawing lines and then colouring them in?? Did you link your card to the Pop Up Challenge?? I had to really push myself to draw the random lines but I enjoyed the relaxation of the colouring. I love the embossing of your second card, would love to get my hands on it, it looks so 3D. And you have your own stamp press?? How fabulous is your DH. Would love to see a picture of it. And your water colour background card is divine. What a gorgeous cover plate too. Hope you have a wonderful time away and lets hope your computer is behaving when you get back!! Wow Hazel there's some lovely cards here. You certainly like to try lots of different things. I really can't chose a favourite they are all very exciting techniques. I'm going to enjoy following your blog.